Screening. An hour-long chat. Questions after questions about the life; the experience of the candidate. Arranging for a 2nd interview with your higher-management. Repeat. Recruiting is tough. Finding the perfect candidate for the hiring manager is an even tougher job. 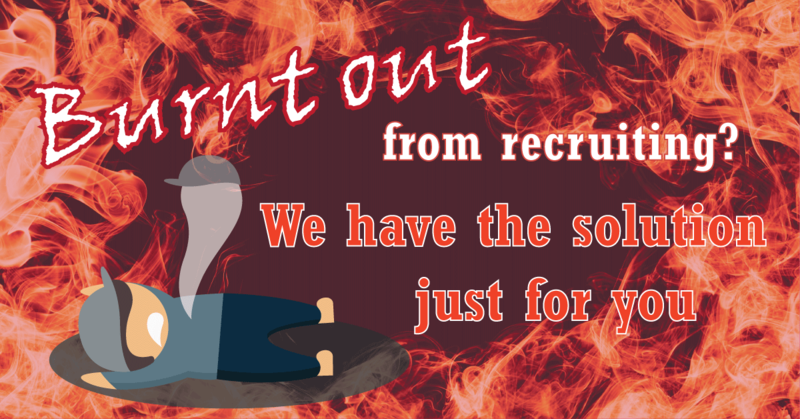 No doubt, chances are, if you are doing recruiting, you will be burnt out in the long run. Being “Burnout” is a state of emotional, physical, and mental exhaustion caused by excessive and prolonged stress. However, the good news is that there are steps and measures which you can take to minimize it. Data remains a big pain point for many HR professionals. The ability to sort through and make sense of the data could be a daunting task for many. Nevertheless, data analytics still holds the key to many HR processes, including recruitment. So how can we use the data? How can it help us to streamline the recruitment process? Through recruitment process outsourcing, the HR professional who is doing the recruitment could liaise with HR solution vendors or data analytics experts to understand the different data points and the way the department can put them together. SOPs and cheat sheets could then be created by to streamline the recruitment process and further use the different information moving forward. The longer it takes to occupy a vacant position, the more costs it has on your company. The need to look for quality candidates to occupy vacant positions speedily is real and accomplishing these two tasks all at the same time can be one of the major cause of burnt out. Make use of recruiting software or an ATS – Applicant Tracking System to simplify your process. At each phase of the recruiting process, you can enter and digitize candidate data. By doing this, you will spend lesser time looking for information but yet have a better tracking at which stage of the interview this candidate is at. This will help you by hastening the recruitment process as a whole. The need to make a speedy hire for an urgent role is one of the biggest pains that recruiters faced. Despite filtering through the qualifications of candidates and going through numerous rounds of interviews, there is still a close competition for talents. Imagine having to do that for multiple openings? Start looking into recruitment tools and methodology, particularly recruitment and employee management strategies and the software used to automate such processes. Ensure all information is documented digitally can shorten the time needed to recruit a candidate. Being overworked and stress will just result in you having an unhappy employee who might leave eventually. Why not, recharged and take better care of yourself and be the employee that you are looking to hire? Payboy is a highly versatile and mobile Human Resources Management System that gets things done anywhere, anytime. We offer integrated solutions that will help you prevent your employees from being burnt out. Check out our Recruitment Process Outsourcing Service which gives you only the best candidates today!